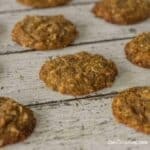 These low carb brown butter coconut cookies are loaded with dried coconut chips. 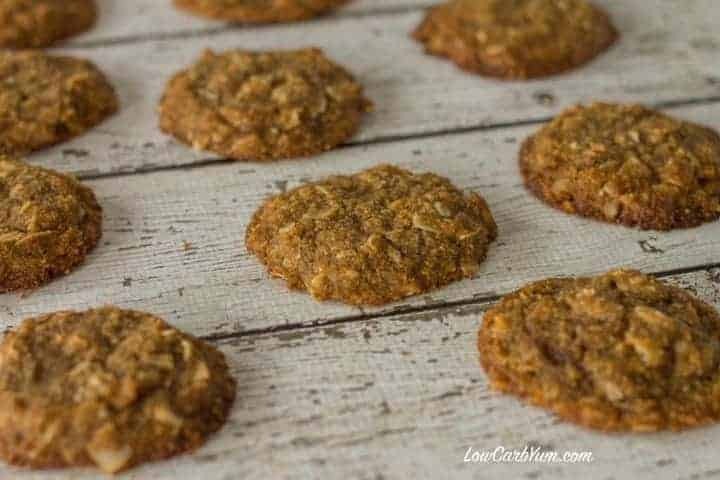 The cookies are also packed with butter flavor and completely gluten free. 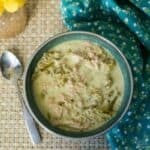 This is the first time I’ve ever done a low carb recipe makeover per reader request. 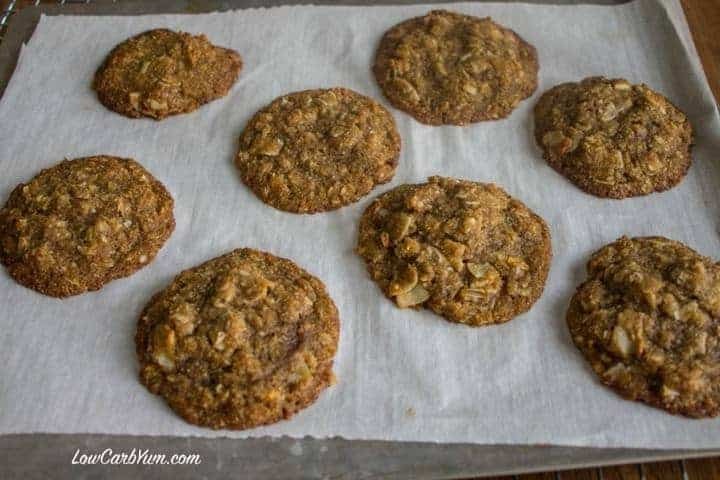 A blog reader was looking to use up a bag of coconut chips and asked me to help convert a recipe for Coconut Brown Butter Cookies found at Smitten Kitchen. Well, I just happened to have a bag of coconut flakes that needed to be used up as well because they were nearing expiration. You can easily make the flour blend up beforehand, but I just make the blend up when I need it. If you look at the original recipe, it calls for 1 1/4 cup plus 3 tablespoons of regular flour. 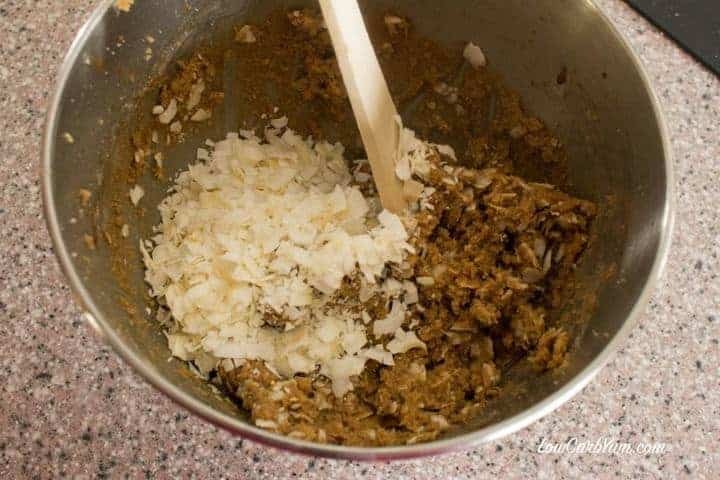 This works out to about 1 cup almond flour and 1/3 cup coconut flour if you use the 3:1 ratio.For those of you who don’t like to do the math, it might be easier to just mix up your own all-purpose low carb gluten free flour mix using 3 cups almond flour and 1 cup coconut flour. I’ve never browned butter before, so this was interesting learning. I thought I was going to burn the butter for sure, but that’s not where my mishap happened. 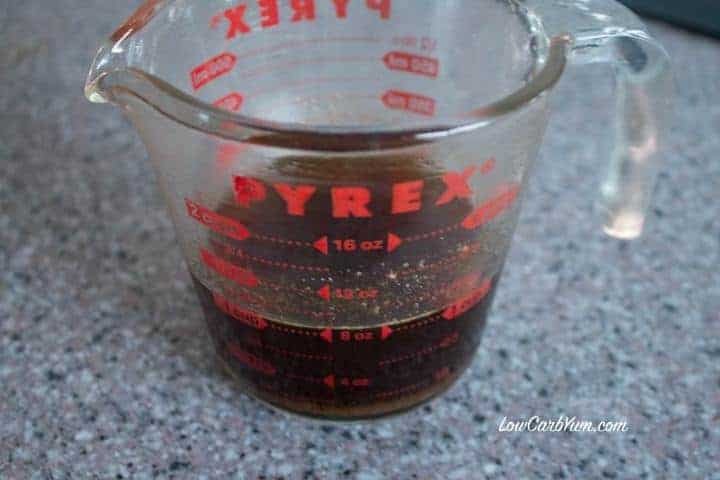 Once the butter had cooked for a while, it turned a dark brown and I removed it from the heat, then poured it into a Pyrex measuring cup. It measured just shy of 1 cup, so the original recipe calls to add about 2 tablespoons of water to get it to a full cup. So here’s where things literally exploded. 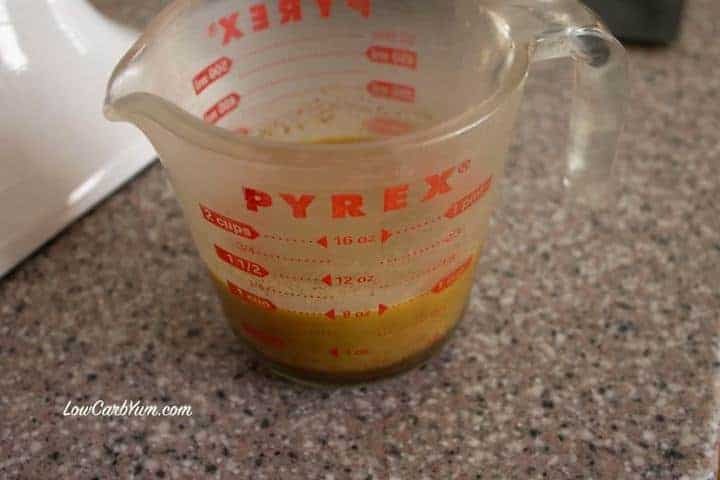 I quickly poured in one tablespoon of cold water and the hot butter foamed up and started pouring out of the top of the Pyrex cup. PLEASE… do not follow my lead. Either allow the butter to cool down a bit or SLOWLY add the water. I ended up having to brown another 1/4 cup of butter as that is about how much I lost from my hot butter explosion. I should also add that I used salted butter and not unsalted because that is what I had. You can see in the photo above how the brown butter looked after sitting in the refrigerator for a couple hours. I used a stand mixer to blend everything together except for the flaked coconut. The coconut chips were stirred in at the end with a wooden spatula because the cookie dough was rather thick and I didn’t want to have to scrape it off the beaters. Stirring by hand gave me a much needed workout. 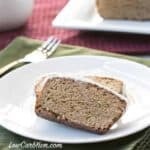 Here’s a few more low carb baking tips. The original recipe calls for brown sugar. 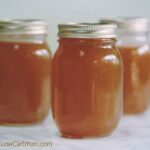 I used LC Foods Low Carb Brown Sugar Sweetener – inulin (they also make a brown sugar sweetener made with erythritol) in a smaller amount and increased the white low carb sweetener, but you could just add a touch of molasses, preferably blackstrap which adds a small amount of carbs. I also increased the amount of egg from one to two because I find that most gluten free baked goods need more egg. The only other change was to add some baking powder which may or may not be needed, but I find it usually helps with leavening. I decided to make medium sized cookies by doubling up on my 1 tablespoon cookie scoop. So, each one of these cookies had about 2 tablespoons of dough. They came out a good size, but not as large as the ones you typically get at the bakery. I also experimented by baking some on a Silpat silicone mat and others on parchment paper. Not sure if it was just coincidence, but the brown butter coconut cookies baked on the silicone mat ended up browning up faster. 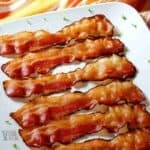 I’d like to thank Jenn, the blog visitor who asked me for help in converting the original recipe to low carb, for bringing this recipe to my attention. Give it a try. 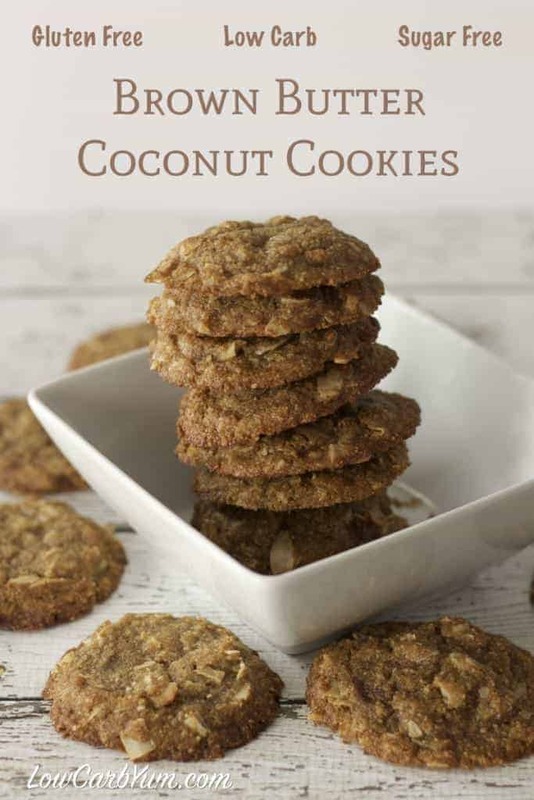 I think you’ll enjoy this brown butter coconut cookie recipe. It was a terrific way for me to use up some unsweetened coconut flakes I had sitting in the refrigerator. Have a recipe you need de-carbed? Send me a note and I’ll see what I can do! In medium sized pot, melt butter on medium heat, stirring frequently. Once it melts, it will eventually foam, turn a clear golden color, and then become dark brown with a nutty aroma. Place butter in refrigerator for 1-2 hours or until solid. 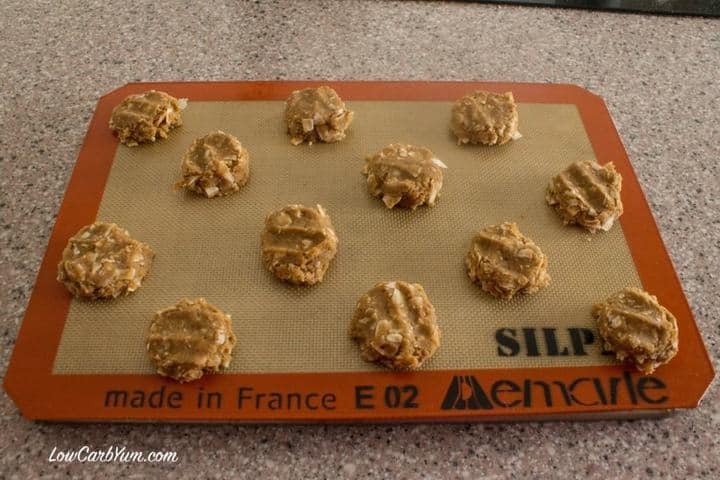 Preheat oven to 350°F and line cookie sheets with parchment paper or silicone mat. Cream white low carb sweetener and browned butter with electric mixture until fluffy (if using extra white low carb sweetener and molasses, it should be creamed in with the butter as well). Add egg and beat until well combined, scraping bowl as needed. Then beat in vanilla. Mix brown sugar sweetener, almond flour, coconut flour, baking powder, baking soda, and salt in medium bowl. Pour half of the dry flour mixture into creamed butter mixture and mix until combined. Mix in the other half of the flour mixture. Stir in unsweetened coconut flakes, half at a time. Flatten each dough ball with fingers or spoon. Allow cookies to cool at least 15 minutes before removing to cooling rack (they may crack if moved when still hot). Since these are sugar-free cookies, I recommend storing in the refrigerator. LC Foods Low Carb Brown Sugar Sweetener made with inulin should be added with dry ingredients, but molasses and regular low carb granular sweetener is creamed with the butter.